Denim is a blank canvas. No longer merely known for its dependable twill-weave or for that matter, limited to legwear, denim’s new (and many) iterations are reframing the wardrobe staple beyond its heritage roots. 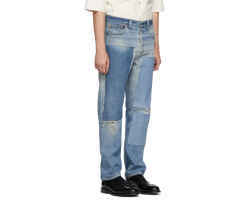 Featured In This Image: Mugler jeans. Who can resist a pre-fade? Most bleaches are oxidizing agents, which means they remove electrons from other molecules. Mugler’s Super Bleach Jeans, with their frayed detailing, seem to mimic tides—or currents of electricity. 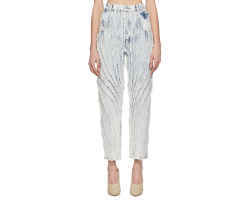 Oxidized or not, these jeans won’t keep you from sparking attention. Model wears Feng Chen Wang jacket. 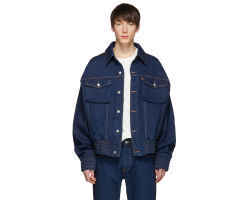 Consider the archetypal denim jacket, and then make it cozy—roomy sleeves, elasticized cuffs, panels from two contrasting indigo washes, oversized flap and welt pockets. Feng Chen Wang’s version packs all this and more, suggesting that the American Dream errs increasingly on the side of comfort. Featured In This Image: Junya Watanabe skirt. While hoop-skirt crinoline isn’t exactly hype in 2019, you can emulate its weight with this Junya Watanabe Panelled Skirt. 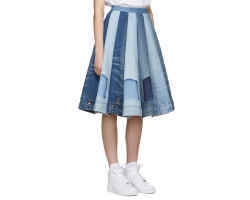 Showcasing the designer’s knack for elaborate draping, the skirt features a multitude of denim washes, panels alternating between pale and saturated. Durability in a skirt is embraced by bus riders and bike riders alike, but this one could still be fit for a gala. Featured In This Image: Y/Project shorts. Featured In This Image: B Sides jeans. The incredible thing about patchwork is that something whole can be made from disparate, otherwise functionless scraps. Why not reinforce your knees, and your jeans, and the knees of your jeans, with patchwork? 2019 shifts its focus to being resourceful, which is exactly the ethos behind the great American quilt.